A Solid structure protects, supports but also limits the creature held within to the extent of almost suffocating it. On one hand this barrier may be meant to shield the vulnerable creature inside from the harsh and judgmental world outside, or instead serve as a protection to the outsider from the erratic and inappropriate being held within. Who needs protection more? It is the fear of the unknown which has created this almost complete lack of communication between the outside world and the content held within these structures. I illustrate this psychological drama by juxtaposing the man-made mechanical aesthetic with a more organic and mysterious inner life. If we feel too inappropriate or vulnerable to face the harsh world outside, how do we deal with that? One approach would be to just shut oneself away and create a safe and cozy nest. 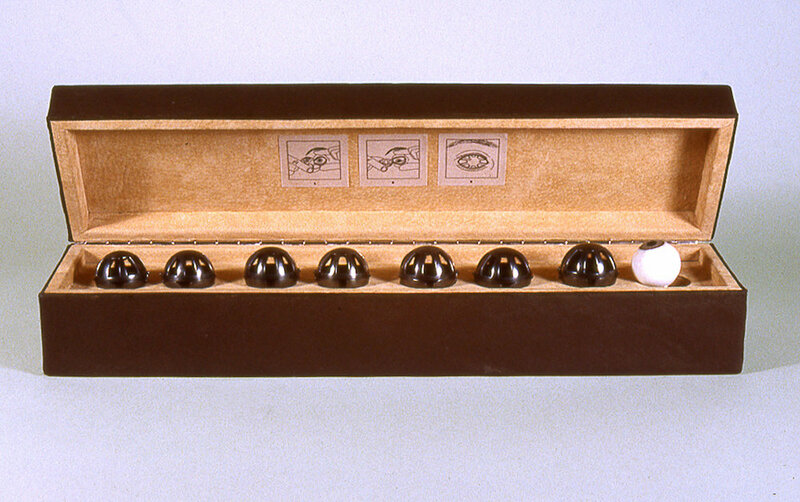 Wheels which stand for motion are in this case arranged in a fashion which allows the suspended box in its center to only to turn around it’s own axis round and round. While trapped in one spot the box emits a persisting sound of a mechanical respirator. The ear horn insinuating a reaching out is stuffed with wax. Film excerpt from the short documentary Eternal Moment by Simone Stammbach. 1998. The film features my earliest artworks which were all created with the use of the traditional metal smithing techniques I learned at Parsons School of Design. This sculpture was inspired by Franz Kafka’s short story A Hunger Artist is the tragic tale of an individual marginalized and victimized by society at large. The protagonist, a fasting artist who experiences the decline in appreciation of his craft os the archetypical creation of Kafka. The sculpture, a cage houses a skeleton pushing a thin membrane almost to the extent of ripping it to reach the inner, golden wall of the cage. 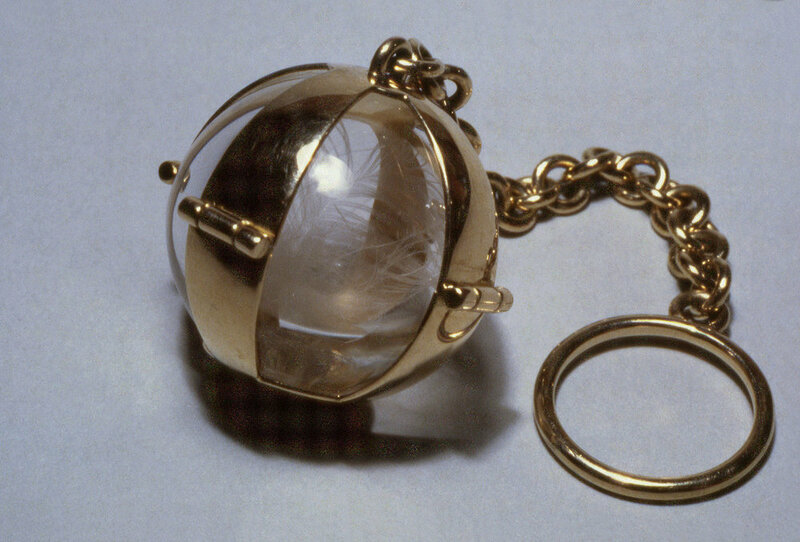 Engagement ring like a ball and chain from a prison. The ball contains a feather from the couple’s blanket. This steel cube–in the size of a human head–emits the sound of Clarina’s voice reciting German romantic poetry. Reliquary neck piece which holds a miniature replica of my sculpture Guardian Angel.